A short while ago I received the following email from Holmdel’s Democratic Chairman Tony Orsini. The email is essentionally an open letter to the Christie campaign expressing Orsini’s desired to take back the endorsement of Chris Christie, which he made back in early January. At the time, Orsini’s endorsement of Christie created a bit of a shock wave around Monmouth County and made for some interesting reading. Orsini was the first Democratic leader to break ranks and throw his support to Governor Corzine’s eventual challenger around these parts, and he caught a lot of grief for it. Now with the election just a few days away, Chairman Orsini has come back to the fold and will vote for Governor Corzine, eventhough it is somewhat begrudgingly. Back in January when Chris Christie declared himself a candidate for governor, I wrote a letter published in the APP endorsing him despite my position as Holmdel Democratic Chair. Probably due in part Joe Kyrillos having a hand in the campaign, Christie showed an inability to address any of the problems facing New Jersey. He also showed intellectual dishonesty in talking about cutting taxes and eliminating the budget deficit both at the same time. Electing Christie would essentially be replacing a “D” with an “R.” The problems would remain. Then Christie did something to really tick me off: he endorsed and had his picture taken with Frank Capaci, Republican candidate for Holmdel Township Committee running against incumbent and former mayor Larry Fink. Mr. Capaci, a.k.a. “Frank the Diet Doctor” (“lose 10 pounds in 10 days”) has been a resident of Holmdel less than 2 years. Mr. Fink is somewhat of a local hero being a strong environmentalist and having a hand in preserving over a thousand acres of land and bringing in millions of dollars to that end. Combining that with the fact that Mr. Christie never listed me on his web site as a supporter (while he lists the megalomaniacal Mayor Serena DiMaso of Holmdel) indicates to me his utter disdain for any Democrat and working to build consensus. So pray tell how will he work constructively with a Democratic legislature? NAHT! Worse yet, the Capaci campaign, directed by Mayor Serena DiMaso, has taken an ugly anti-semetic turn. I will hold my nose and vote for Jon Corzine. Hey, he’s a marine! Print that, Gallagher! What was so Important That Kyrillos Needed To Speak To Christie 48 Times Between 2002 & 2008 ? Can anyone tell me what was so important, that Monmouth County State Senator and current Christie Campaign Director Joe Kyrillos (R-13), needed to talk to Chris Christie about 48 times between 2002 and 2008? I know the two are old-time college buddies but during this time, to make 48 attempts at contacting Christie while he was US Attorney seems fishy. Could it have had to do with his relationship with shady developer Jack Morris and the questions that surounded the re-development of the Matawan-Aberdeen Train Station? Or a possible “Thank-You” call to express apprieciation for his brother Todd Christie’s donation of $225,ooo to the State Republican Committee that Joe Kyrillos headed? Or did he want to discuss details of “Operation Bid Rig”? Of course, Kyrillos just may have been lonely and wanted to reminness about the old-times but somehow I doubt it. Republican State Sen. Joseph Kyrillos (R-Middletown) is part of GOP gubernatorial candidate Christopher Christie’s inner circle; some details of their friendship are apparent in a log of calls from Kyrillos to Christie between 2002 and 2008. Kyrillos left messages for Christie at the U.S. Attorney’s office 48 times between 2002 and 2008, including 19 times while Kyrillos was the Republican State Chairman, according to a log of Christie’s incoming phone calls requested by the Corzine campaign as part of an extensive series of document requests under the Freedom of Information Act (FOIA). The Corzine campaign received the phone logs late Friday. Most of the phone messages shed little information as to the topics Christie and Kyrillos were discussing. Kyrillos tended to call after 5PM, and would usually leave a message that offered little detail. Kyrillos did call Christie on April 22, 2002, the day Todd Christie wrote a $225,000 check to the Republican State Committee. These records don’t reflect completed calls, or incoming calls from Christie to Kyrillos, if there were any at all. These 4 classic Halloween themed Buggy Bunny cartoons close out my Halloween spectacular for this year. I hope that the rest of your Halloween is a safe and enjoyable one. ComiColor Cartoon, directed by Ub Iwerks, based on “The Legend of Sleepy Hollow.” Released to theatres 1 Oct 1934. Music by the legendary Carl Stalling. BBC show ‘Secret Life of Ghosts and Werewolves’ takes a spooky journey to Haiti to see a festival of the dead. Can witchdoctors raise the dead and create zombies? Make up your own mind with these chilling videos! The children looked out of place in the night. Craig Besand walked down the street toward his flat in Norwich, England, when two figures approached him. At the time Besand, a Missourian, was studying abroad at the University of East Anglia in Norwich. Between Besand’s flat and his friend’s flat was a cemetery – that’s where he saw the children. He’d made it a few blocks when he saw two figures approach him. The age of the children and the late night struck Besand as strange. As Besand escorted the boys toward the cemetery, he looked at them closer. The oldest boy’s hair was jet black, “his skin was porcelain white and veiny.” Then Besand saw the eyes. 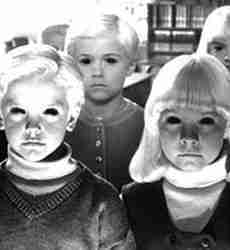 He asked these Black-Eyed Children where they lived. They named a nearby street. “I thought that was strange because this cemetery is huge and almost everyone in town knows where it is,” he said. When they reached the cemetery gates the older one asked Besand to come in with them. The younger Black-Eyed Child, Besand noticed, appeared nervous. Then the older child’s demeanor changed. The grin, Besand found, was hypnotic. About a week later, Besand wandered into a magic shop whose owner, he discovered, was Wiccan. Besand asked her what they were. He asked her why they would want him to go willingly with them to the cemetery. Jason’s books on the paranormal, “Darkness Walks: The Shadow People Among Us,” and “Haunted Missouri: A Ghostly Guide to Missouri’s Most Spirited Spots,” at Jason’s blog, from-the-shadows.blogspot.com. Werewolves – myth or reality? Bordeaux, 1989. A werewolf stalks French streets. – or does it? Listen to the spooky tales of werewolf strikes reported in the world and take a closer look at the psychological reports around one of the most unusual cases ever seen in this video from BBC chiller ‘Secret World of Ghosts and Werewolves’.